Corn goes through several stages from germination to maturity and is picked fresh for eating when the kernels are plump and filled with a liquid referred to as milk. If left on the plant beyond that time, the corn kernels become very starchy and dry and can be ground into meal that is used to make a variety of baked goods. Cornmeal is combined with other ingredients to produce ready-to-use cornbread mix. When the corn has reached what's known as the "dent" stage -- when each kernel has a small depression in one end signifying that it has lost most of its moisture -- it's ready to grind, and this is accomplished through several methods. Stone-grinding the corn results in large, coarse grains that are generally used to make polenta or are cooked as a hot cereal known as grits. The color of the cornmeal reflects that of the corn kernels and can range from white and yellow to blue. Finely-grained corn is milled several times to produce the type of cornmeal that's added to cornbread mixes used to bake breads and muffins. A premade cornbread mix saves time and provides an alternative to preparing the bread or muffins from scratch. A typical mix generally contains finely-ground cornmeal, wheat flour, a leavener such as baking powder, sugar, some type of fat (usually lard), baking soda and salt. To make muffins or bread, all you do is supply the liquids in the form of eggs and milk. 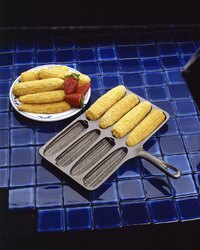 The batter can then be baked in the traditional square pan, muffin tins, loaf pan, in a greased cast-iron frying pan or in any type of specially designed cast-iron molds that produce specific shapes such as miniature ears of corn. There are two ways to make cornbread from scratch: by starting with plain cornmeal or by using self-rising cornmeal mix. The self-rising cornbread mix differs from a complete cornbread mix in that it contains only baking powder and salt and requires the addition of a small amount of flour, a sweetener and liquids. As a regionally Southern product, it's not always available elsewhere, but you can make your own by adding flour, baking powder and salt to plain cornmeal. Self-rising cornmeal mix is generally used in recipes that were developed around it. If you plan to use it to make cornbread or muffins, adjust the recipe to allow for the ingredients the mix already contains. In addition to baking bread and muffins, you can use plain cornmeal to make griddle cakes and to coat foods for frying and baking. Cornmeal is also used to dust the baking pan when making yeast breads such as French baguettes and sourdough boules. The cornmeal keeps the bread dough from sticking to the pan and gives the bottom of the loaf a crunchy texture. On a more savory note, the versatility of cornbread mix also lends itself to crusts for meat pies and casseroles, as in a cornbread pie that calls for smoked sausage, mashed sweet potatoes and sharp Cheddar cheese seasoned with onions and bell peppers. Basic cornbread mix also provides the base for a tasty cornbread pudding when combined with whole kernel corn, cream-style corn and sour cream.